Yet another beautifully written article from the Quietus, this time about Nick Cave And The Bad Seeds‘ LP “Let Love In”. I’m not sure about the conclusions though – I think this is a long way from being the best Bad Seeds’ LP. The title of Nick Cave And The Bad Seeds’ eighth studio album was not, as some may have expected, ironic or sarcastic. He may sometimes be theatrical, he may sometimes be hyperbolic, but the Black Crow King is never one to make light of what he knows to be the biggest governing force in his life. At the beginning of 1993, Cave was recently married, reveling in fatherhood and was by his own account a happier human being than he’d been in some time. He had just returned to London after spending three years with his young family in Brazil and, after a few extra jaunts about Europe with the Bad Seeds hot off the success of Henry’s Dream, Cave holed up in a little pub on Portobello Road and began writing his next album. And while death still pervades and darkness still penetrates its lines, domestic bliss made Let Love In a comparatively positive record. In preparation of writing this article, I’ve been reading Ian Johnston’s biography of Cave Bad Seed. Having been published before Cave dropped Murder Ballads, the book wraps up a short time after the release of Let Love In, declaring it “not only one of the most accomplished and fully realised records of Cave’s entire career, but also the most commercially successful”. While the latter claim was usurped by Murder Ballads a few years later, I’m inclined to believe the former statement still rings true. Musically it is the culmination of the preceding records. More focused, less wild, but still smouldering with intensity. Most importantly, it is a conscious effort on Cave’s part to inject more of himself into the subject matter of the lyrics and rely less heavily on stepping into the shoes of various characters. Most of his work is inward looking, but Let Love In is notably personal. The album came together shortly after his relocation from Sao Paulo to London. Though the previous two records contained some samba-flecked moments of Brazilian influence, I think that the number one thing that his time in Brazil gave Let Love In was introspection. Spending years in a country without learning the language caused Cave to become more isolated than he’d ever been. Yet it wasn’t entirely exile. Cave’s marriage to Brazilian journalist Viviane Carneiro and the birth of his son Luke in 1991 kept him steeped in inspiration. Let Love In came out of happiness just as the later The Boatman’s Call would come out of heartbreak. Before exponentially expanding his bodycount and cast of deranged characters on the next record, Cave and the Seeds took a deliberate detour first. Yet ever the “reliable old beast”, as Cave called them, the Bad Seeds provided work that could have easily found a home sketching the scene of another massacre on Murder Ballads. The differences are subtle; many protagonists are less caricatured, struggling with much more inner conflict than the cold and murderous sociopaths sauntering through much of Cave’s back catalogue. But the album doesn’t stand alone as such. He would be equally personal later in his career and was equally hateful on earlier work. Let Love In just has it all: the seething punk and the roving balladeer. The bookends ‘Do You Love Me’ and ‘Do You Love Me (Part 2)’ are near-perfect and were among the first to be recorded, though according to Cave they took months to put together. The latter in fact went through hundreds of edits. It tells the story of a child’s first sexual experience through his molestation by a man with “sly, girlish eyes” in a movie theatre. Flawlessly executed, the narrative seems almost ethereal, like an out of body experience, but at the heart of it brandishing a dark truth: once that innocence is taken, you can only keep on moving on. You will be hard pressed to find a lyric more effective at portraying the confusion and surrealism experienced by a child so violated. Luckily the opener is not quite as horrific. ‘Do You Love Me’, in its tolling bells and sinister, sleazy atmosphere, does address inner conflict but it also looks at the reasons why we suffer for love. The descending trudge of the chorus line is made funeral dirge by The Bad Seeds’ booming backing vocals before rolling into the lovely intro to ‘Nobody’s Baby Now’. Playing as he often has on his obsession with Jesus as an enigmatic figure, Cave plays a man confused by the loss of his love and trying to come to terms with a decision and the human behaviour around it. However, it isn’t clear whether it is by the hand of the narrator or “she” that the subject of affection comes to be “nobody’s baby now”. Aside from the swaying western-tinged title track, the two other slow numbers ‘Ain’t Gonna Rain Anymore’ and ‘Lay Me Low’ come back-to-back near the end of the record, where Cave brings the listener through an account of a tumultuous affair’s end before penning his own obituary. Well, I suppose it’s not so much an obituary as a (stunningly accurate) prediction of how his death would be handled by his fans, friends, media and naysayers respectively. Then there is the lit firecracker that is ‘Jangling Jack’. Cave’s “ode to America” is made purposefully short and hateful. He’d grown disillusioned with the States; from his point of view, it was riddled with corruption, and was injudiciously steering international politics out of control. ‘Jangling Jack’ is a throwaway that serves its purpose well but also provides some of the sizzling angst of his early work, in many ways it’s the token punk rocker. Though Cave’s apology for everything he’d ever done ever, ‘Thirsty Dog’ is swiftly behind in that race, led by Blixa Bargeld’s frantic guitar. ‘Loverman’, is a raucous tale of hard living – a man attempting to take power over himself and raise himself up by taking power over another. The Bad Seeds are on form with bridle and ballast here, bringing low and doomy accompaniment in the verses before roaring and undulating with drum fills into the chorus of Cave’s howled lines like “So help me / Cause I am what I am what I am what I am”. ‘Red Right Hand’, much like its central character, ain’t what it seems. The lyrics were mostly improvised, as opposed to the hours he pored over the opener and closer, but it remains just as powerful, taking a few further swipes at America and its culture of overwrought sentimentality. A stone cold classic and a gem in the band’s live set to date. In hindsight this album would be a stepping stone in the Bad Seeds’ commercial development, even though the biggest success to come would turn the initial intent of Let Love In on its head. Murder Ballads solidified Cave’s reputation as a storyteller, letting loose a slew of vivid anti-heroes of all shapes and sizes. It was as if the lascivious characters Cave had been depriving of a voice clawed to the surface and burst forth to wreak havoc and leave nothing but blood and bodies in their wake. Some of the tracks even began to take shape before Let Love In was completed, and left to simmer over the three year interim. But even given this hindsight Let Love In is still a perfect encapsulation of everything Bad Seedsian. This incarnation of the band was so strong at this point and as a result Let Love In benefits from true collaboration and mutual interpretations. It’s kaleidoscopic; a whirling, careening carnival of ugly noise and dark lust underpinned by beauty and passion. It’s everything you could expect from them and everything you could want, plus a few things even your darkest morbid curiosities would never dare to ask for. 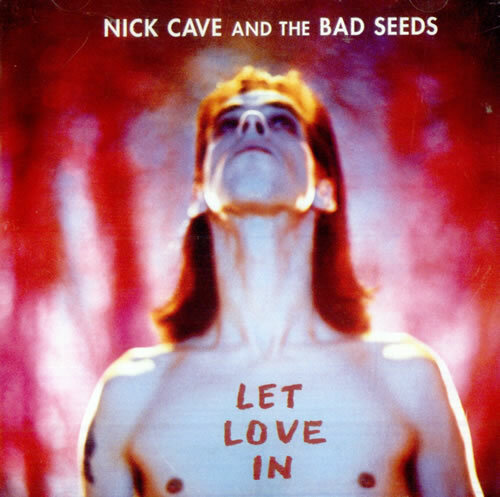 via The Quietus | Features | Anniversary | His Catastrophic Plan: Nick Cave And The Bad Seeds’ Let Love In.